Facebook’s own reporting tool, with its near infinite possible combinations of column sets, metrics and dimensions, doesn’t do much in the way of helping either. So in order to make the lives of marketers easier, we decided to make a short list of metrics to view with your breakfast. Why breakfast? Because breakfast is the most important meal of the day. Skip it and you will surely be hangry all morning. The same applies to metrics – if you keep track of the ones that matter, you'll save yourself from headaches and confusion. Guess who didn't view metrics with their breakfast this morning? CTR, CPM, CPC, reach, impressions, clicks, unique clicks – the list goes on, and on, and on. These are the metrics you are shown everyday on your Facebook ads dashboard. They are important metrics, but most of the time they can’t exactly help you understand if you’re achieving the goals of your campaigns. If you base your campaign optimisation decisions on these metrics alone, you are unlikely to obtain the results you want. Why? Because these metrics only scratch the surface – you might have a high click-through rate (CTR) and a low CPM or cost per click, but are the people who are seeing and clicking your ads actually doing what you want them to do? Then what SHOULD you be looking at? Cost per Action (CPA) - This seems like obvious, but we still come across loads of advertisers measuring the wrong cost per action. Facebook's optimised bidding algorithm is designed to optimise for what you care about, so setting the wrong objective, will result in poor performing ads (most of the time). The same goes for your own daily reporting. Make sure you are tracking the thing you actually care about. For example, your cost per click is irrelevant, if you care about website purchases. It might be (and is often likely with Facebook ads in particular), that more expensive clicks, result in cheaper cost per purchase. Ad Decay (The CPM & CTR combo) - Ad decay is the number 1 killer of Facebook Ads campaigns (probably after not setting a high enough bid price!). I can't count the number of times people have called us in a panic, because impressions are down, and cost per action is up! This is the dredded ad decay. Ad decay is caused by a number of factors that could be high frequency, low relevancy score, low engagement or even bounce backs from your website. Fixing is usually requires rotating in fresh creative to your Adset, and spotting the early signs of decay are critical (just like your dentist says). A couple of easy metrics to monitor to spot ad decay early are CPM and CTR. 99% of the time, CPM is a useless metric in Facebook advertising (because high CPM doesn't necessarily mean high CPA). However, when charted over time alongside CTR, its much more interesting. You can spot ad decay early when CPM starts increasing, and you'll often see CTR decreasing alongside it. This is because you're either reaching a lower quality audience within your targeting, or people are just sick of seeing your ad! Frequency - Frequency is the average number of times a person saw your advert. The ideal frequency will depend on your audience – if they don’t know you already they might take a little longer to react to the ad than, for example, your fans, so a slightly higher frequency is acceptable. However, has your advert been seen 6.2 times and not been yielding the results you want? Then it is probably performing poorly and it might be the right time to refresh it or pause it. Depending on how fast your ads decay (see above), we find that rotating out the worst performing ad with a fresh creative helps keep your Adsets alive longer! The frequency that you replace the worst performer depends on how fast your ads are decaying. This way you store all the rich conversion history in your Facebook Adset, but keep creative fresh. Profit - Another seemingly obvious one, but this is where you can boost your marketing performance the extra few percent over your competitors. When we talk profit we mean profit per Adset and Campaign. You could measure this on an ad level too, but there unlike keyword profitability with Google, it's probably more hassle than it's worth. Simply aim for the best possible ad performance with the targeting you've chosen, and set a bit strategy the same across your ads. Remember that return on ad spend, and cost per action, are not looking at profit! If you are a retailer, then you'll likely have different gross margins for each product. Or if you're an automotive brand, you'll have a different margin depending on the number, and models you sell. Using a flat cost per lead/or cost per checkout for all your campaigns and adsets is fine to get started with, but if you understand the margin you generate for each adset and campaign, you can modify the bid price and compete harder with competitors not doing the same. For example, if you sell luxury saloons, and SUVs, applying a flat cost per lead caps your potential returns. Although the luxury saloon might cost more, it might be that you generate more sales and gross margin from SUV campaigns, and therefore should increase your target cost per lead on Facebook. If your competitors aren't doing the same, you'll beat them in the auctions! While marketers have a plethora of shiny metrics to track Facebook ad performance, there are 4 that matter the most: Cost per Action, Ad Decay, Frequency and Profit. These metrics provide you a pretty good overview of your Facebook ads and tracking them regularly will save you time and trouble. Do you need some inspiration for your Facebook ad campaigns? 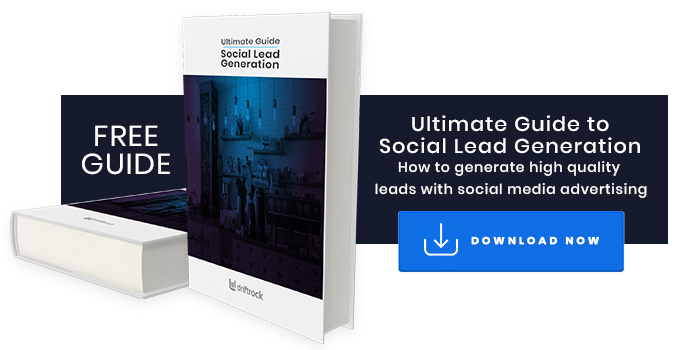 Get our free guide to paid social media lead generation below. Want some help with your Facebook ads? Have You Leveraged These Unique Birthday-Targeting Features?